I’m guessing you’ve seen these guys before. These precious little cookies from French-trained Japanese baker Maa Tamagosan have had me all sorts of cookie jealous ever since I first laid eyes on them. So. Genius. This sneaky little ghost project is my spin on her brilliant design. My ghosts were after my candy corn and pumpkins, but the ghosts in your house might be after Milk Duds or chunks of licorice. 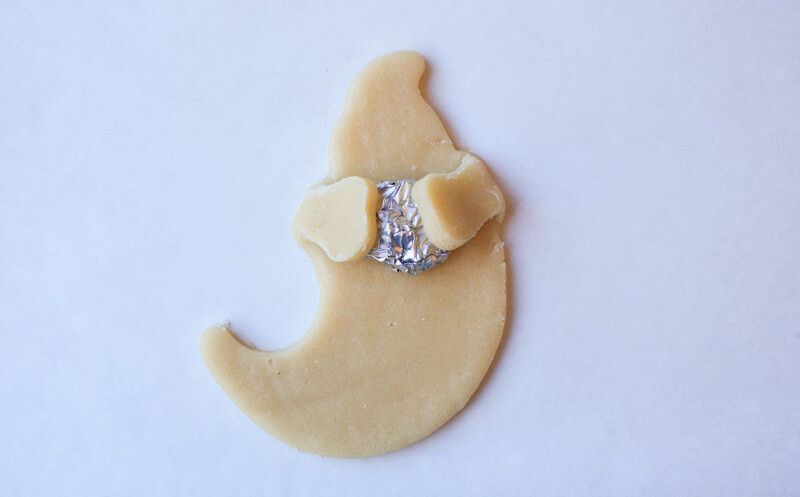 Just be sure to use a ball of foil similar in shape and size to the candy you’ll be replacing it with. 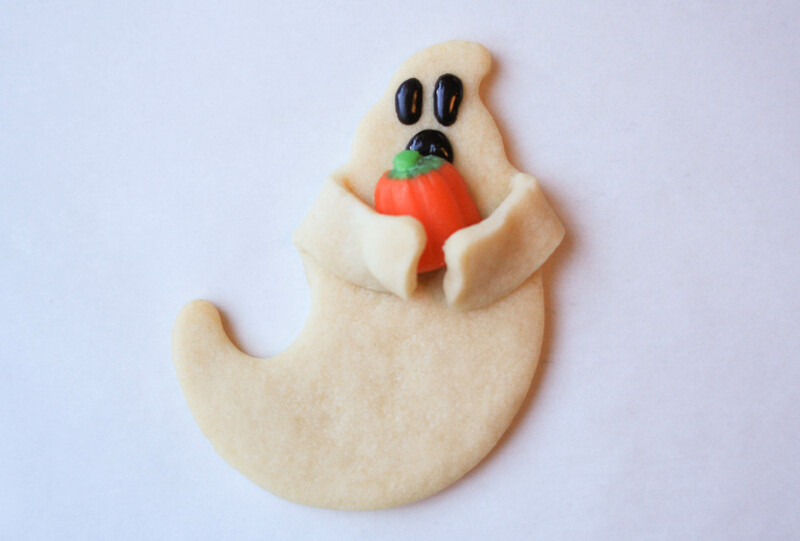 To achieve the hugging effect you’ll need a good cut-out cookie recipe that won’t spread. 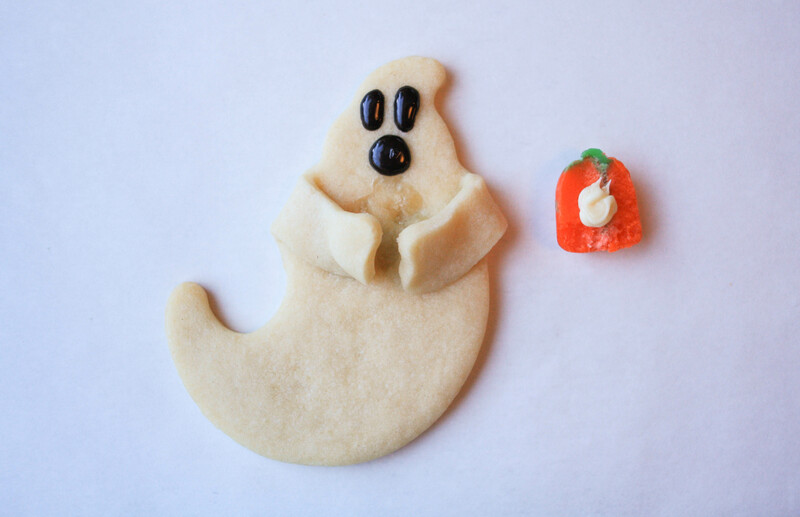 I used this sugar cookie recipe from Sweetopolita’s new Bakebook. I’ve also used this one from LilaLoa with much success, Vanilla 2.0. 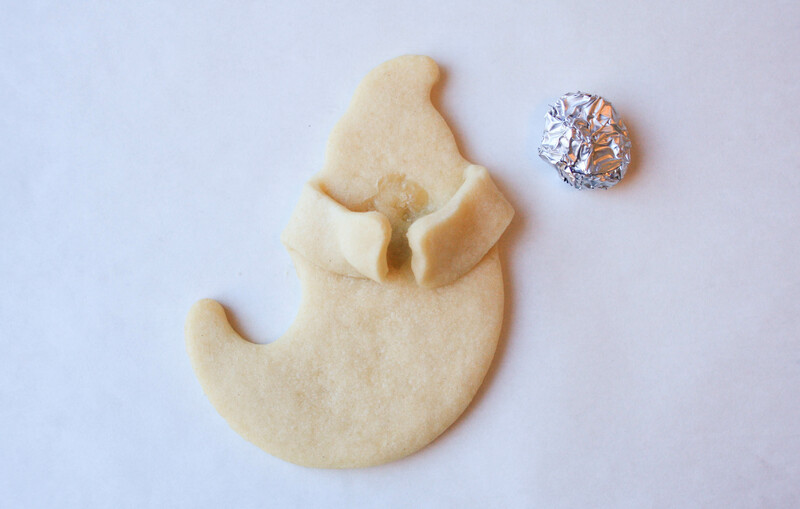 Roll your cookie dough between two sheets of parchment paper to about 1/4-inch thick. Pop the dough in the fridge to firm up, 15-20 minutes. 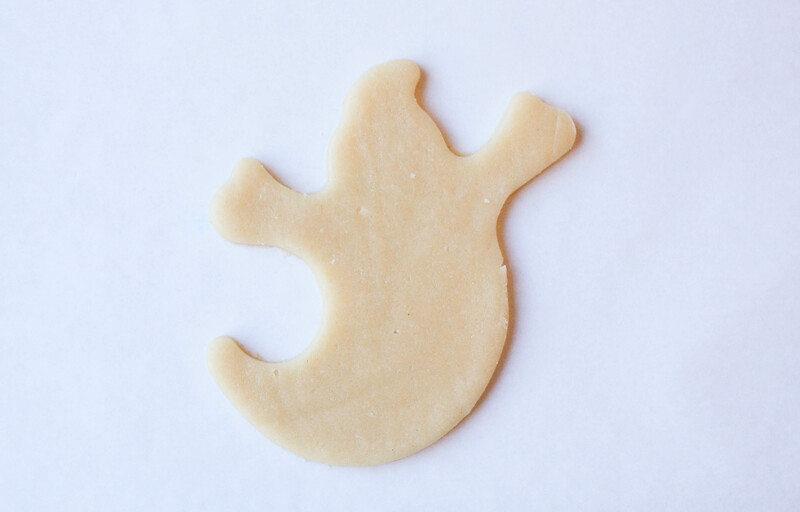 Cut ghost shapes from the firm cookie dough and line them up on a parchment paper lined cookie sheet leaving about an inch or so between each cookie. Let the cut-outs come to room temperature. 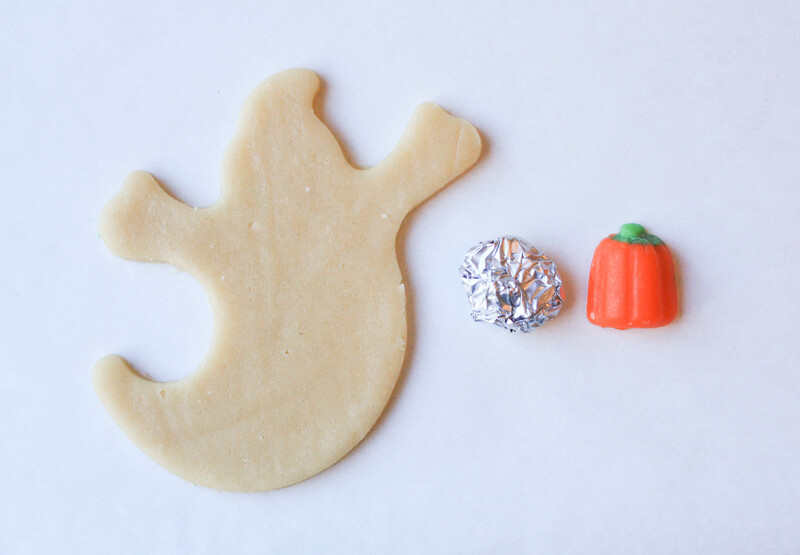 While the cookies are coming to room temp, make tiny balls of foil similar in size to the pieces of candy your ghosts will be carrying. I cut my candy corn pumpkins in half so that they’d lay flat against the cookie. 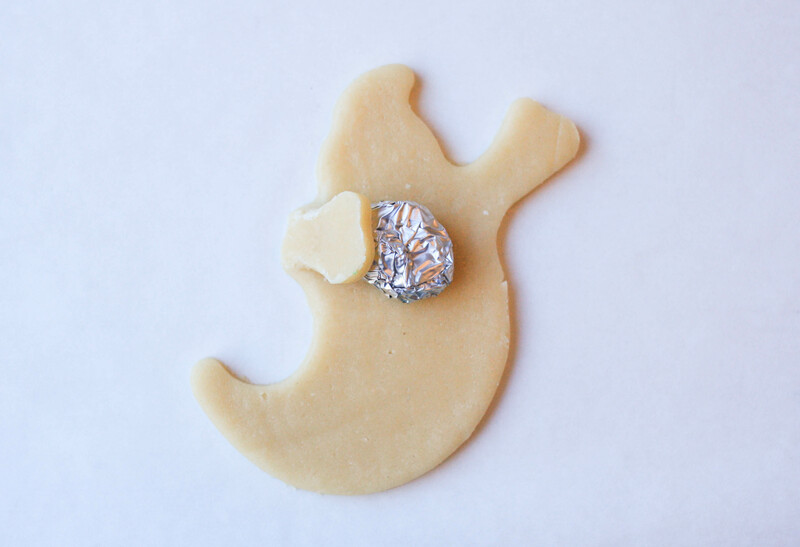 Place a piece of foil onto the ghost cookie and gently fold one of its arms on top of it. Stop here if your ghost is making a one-handed grab or continue on with the other arm. Repeat with the rest of the cookies. Place the completed sheet of cookies into the freezer for 15 minutes. This helps to keep the cookies from loosing their shape. Bake the cookies according to your recipe’s instructions. Allow the cookies to cool completely before carefully removing the foil balls. Don’t worry if you break an arm or two, they’re easy to patch up with a little melted chocolate or royal icing. The scars will look cool. It is Halloween, after all. 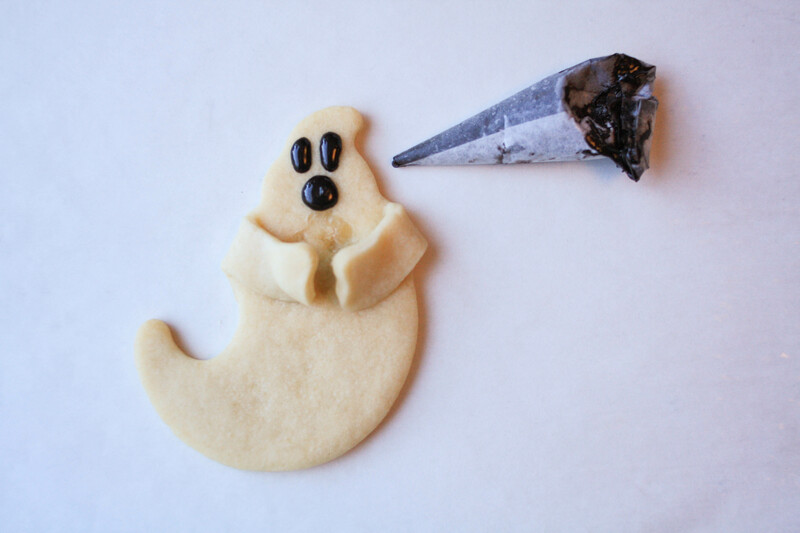 Fill a paper cone or piping bag with melted chocolate or black candy melts. Pipe on your ghost’s eyes and mouth. You could absolutely flood the entire cookie with white royal icing before adding any of these details. I just didn’t have it in me to do so today. I’m the world’s most impatient cookie decorator. Pipe or smear a little bit of melted white chocolate or icing on the back of the candy and slide it into your ghost’s hands. Now go catch these guys and gobble them up before they run off with the peanut butter cups! Nobody touches my peanut butter cups. Erin, I love these. I planned to make some sugar cookies this week but being non-creative I figured I would do pumpkins with orange sugar. 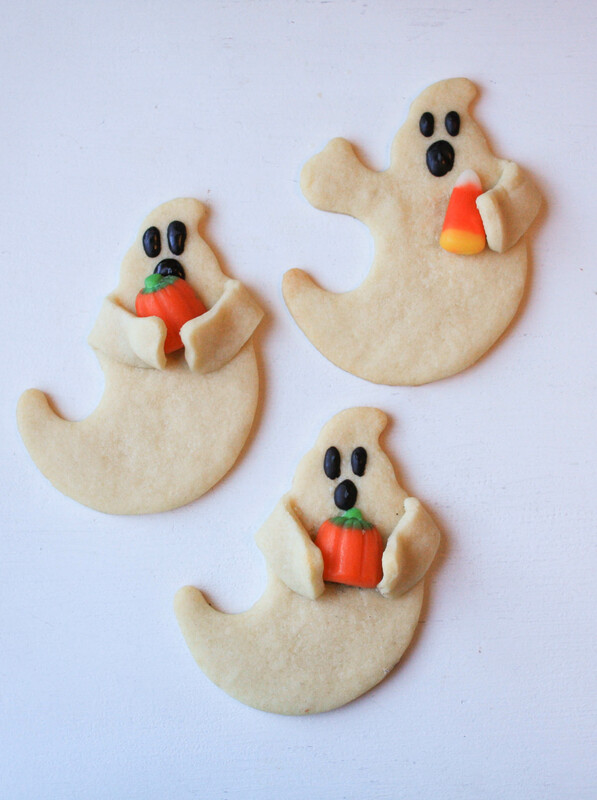 These look fairly simple too, I will just need to find a ghost cutter with longer arms than mine has. I do love my sugar cookie recipe but it would definitely spread. Thanks for sharing with your legions of fans. Thanks so much, Jane! 🙂 They really are pretty easy to make. I’m so not into involved cookie decorating and these came together pretty quickly. Please send recipe of the sugar cookie that don’t spread. Hi! I link to two very good recipes in the text above. One is from Sweetopolita and the other is from LilaLoa. Thanks!